Based on its 15th annual return policy survey, ConsumerWorld.org reports that while a few prominent retailers are tinkering with their return deadlines or adding some novel features, most stores' return policies have remained about the same as last year. Many retailers are continuing to offer special extended holiday return windows. This allows gifts purchased in November to be returned until mid- to late-January, considerably beyond the normal return deadline in some cases. Stores are also still "slicing and dicing" their return policies, creating complicated rules for different categories of items. Electronic items may be subject to shorter return periods than say, clothing. Opened goods or those missing original packaging may be subject to limited return rights or restocking fees. Some stores track shoppers' return frequency in a database. Restrictions like these aim to reduce return fraud which is predicted to account for 10-percent of all returns this year - a one percentage point drop since 2017, according to the National Retail Federation. And they predict that 21-percent of unreceipted returns may be fraudulent. The complexity of stores' return policies is underscored by their sheer length. The policies of the dozen stores in the accompanying chart span some 79 pages, totaling over 31,000 words. Amazon is now paying for return shipping on items purchased by voice using Alexa. Walmart customers can now start their return on the Walmart app by scanning the receipt, and then finishing it in-store at the express lane. Sears increased its return window to 45 days from 30 days for Shop Your Way members. They also tripled the return period for mattresses from 60 to 180 days. Bed, Bath & Beyond dropped its no-time-limit return policy. Now it is one year. Macy's returns deadline remains 180 days for most items. Some items subject to 0, 3, 14, 30, 45, 60, or 120-day return limits. Macy's decreased the categories of goods subject to its extended holiday return deadline of January 31, eliminating Apple products and area rugs. Target shortened the holiday return period for most Apple products from 30 days to 15. At Amazon, groceries, pet food, wine, and plants are not returnable but may be refundable. For some other items, customers are issued instant refunds upon shipping them back. Target REDcard holders get 30 extra return days, and everyone gets free return shipping for Target.com purchases. Best Buy adds 15 to 30 extra days for elite members. Store brands at Target have a one year return period; five years at Bed, Bath & Beyond. At Saks Fifth Avenue, full price purchases returned after 30 days get current price only. Some retailers require tags to remain on dresses and gowns to thwart "wardrobing." Without a receipt, Walmart gives customers the option of a cash refund (if the purchase was under $25), a gift card for the amount of the purchase (if it was over $25), or an even exchange. Walmart tracks returns in a database and may deny excessive or even any returns. "If shoppers follow the rules, they should have many happy returns," said Edgar Dworsky, Founder of Consumer World�, a leading consumer education website. "But, since the rules vary so much from store to store, you really have to read the fine print." Amazon.com January 31 for most items shipped 11/01 thru 12/31. Late returns: 20% restocking fee. Bed, Bath & Beyond One year return window. Stores brands have a five-year return period. Best Buy January 12 for most purchases Oct. 28 - Dec. 28. Elite members may get more time. Costco No deadline, but 90 days for: TVs, computers, cameras, smart watches, MP3 players, cellphones, projectors, and major appliances. Kohl's No deadline, but premium electronics bought Nov. 1 - Dec. 25 returnable until January 31. Macy's stores 180 days for most returns. Some item categories have 0, 3, 14, 30, 45, 60, or 120-day deadlines. Holiday return deadline is January 31 for most items purchased since Nov. 1. Marshalls January 23 for purchases Oct. 14 - Dec. 24. 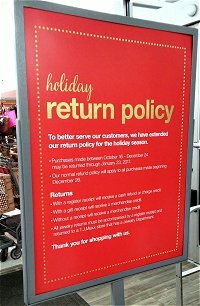 This retailer posts clear in-store signs about their extended holiday return policy every year. Sears January 31 deadline for most 30 day items except major appliances purchased Nov. 1 on; Shop Your Way members get 45 days. Report certain damaged goods within 72 hours or no refund; 15% restocking fee on certain categories like furniture, opened electronics, etc. Staples No deadline for office supplies. January 12 for electronics & furniture bought since Nov. 18. TJ Maxx January 23 for purchases Oct. 14 - Dec. 24. This retailer posts clear in-store signs about their extended holiday return policy every year. Target 90 days most items. But 30 days for electronics and entertainment items, 15 days for most Apple items. Days begin 12/26 for these items since 11/1. Stores brands - one year. May deny refund for opened/damaged/unreceipted items. REDcard holders get 30 extra days. Walmart stores 90 days most items. For purchases made October 28 onward, 15 days (PCs, cameras, GPS, more), 30 days (a/c, pressure washers) but count days starting December 26. Return policy law varies state to state. Generally, a store can set up any return policy it wants, whether it is "all sales final", "merchandise credit only", or "all returns in 30 days." Many states require the policy to be clearly disclosed to the buyer prior to purchase, usually by means of a conspicuous sign. Some states do not consider a disclosure that only appears on the sales receipt to meet this requirement. It is not unreasonable, however, to require customers to provide a sales slip or gift receipt to establish where and when the item was purchased, and at what price. Those with a gift receipt will generally only receive an even exchange or store credit, but not cash. Don�t fight the crowds on the return lines the day after Christmas; grab some of the advertised bargains instead. Go back a day or two later. To improve your chances of getting full credit, provide a sales slip or gift receipt, return the item in new condition, unopened, and with all packaging material. Returns without a receipt are subject to the posted return policy, which might result in your receiving only a merchandise credit for the lowest price the item has sold for recently, or possibly no refund or exchange at all. If the item to be returned is defective, some states such as Massachusetts, require the store to give the consumer his/her choice of one of the three "R's": repair, replacement or refund, irrespective of the store's posted return policy. Consumers who have a problem returning a gift, should first contact the store manager or customer service department of the retailer. If a satisfactory resolution is not obtained, then a complaint can be filed with the state Attorney General's office or local consumer agency.